I spend a lot of time playing games and doing activities that my kids enjoy, but one of my favourite ways to bring them into “my world” of interests is through cooking, baking and decorating. Whenever there is a holiday coming up, I’ll sit down with my girls, poring over Pinterest and choosing our favourite cakes or cupcakes that we want to make for their class parties. 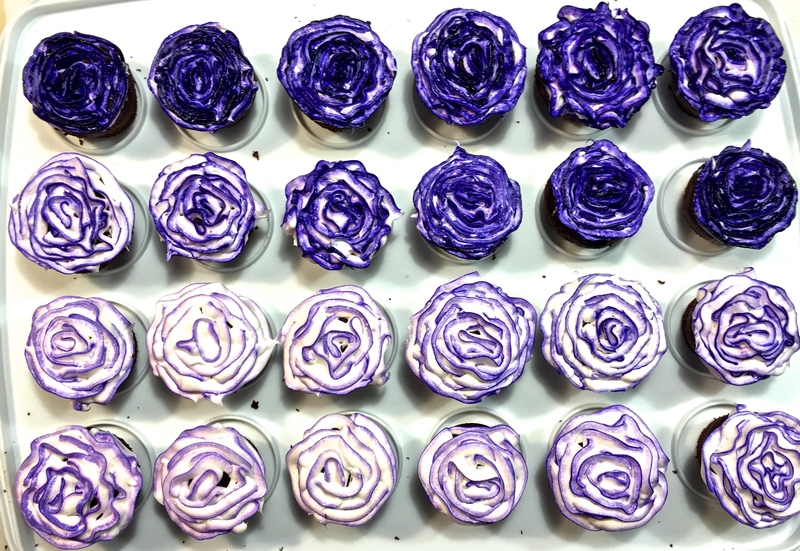 This year for Valentines Day, we had a lot to choose from, but with time and budget constraints factored in, we settled on trying out Rose Cupcakes for the first time! 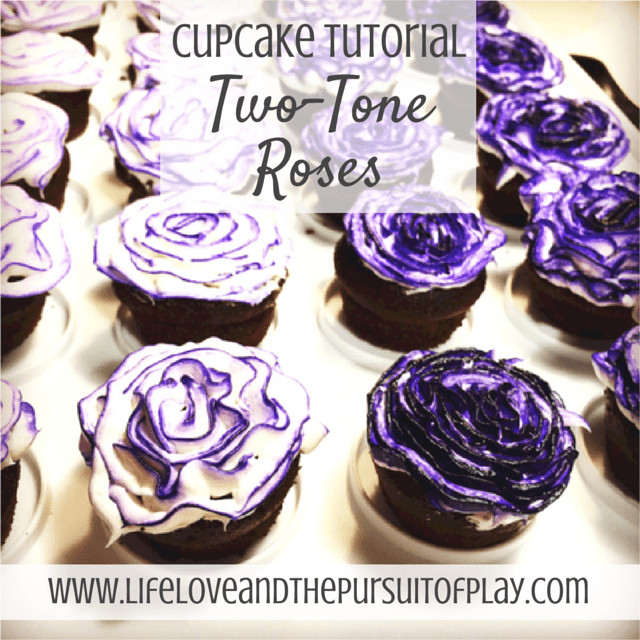 I’ve laid out the step by step instructions with photos and notes on how to make 2 tone rose cupcakes right here, followed by a video tutorial at the end. Step 1: Insert your decorating tip into your decorating bag, either free standing or using a coupler. I used a Wilton #101 Decorating Tip with a Wilton Disposable Decorating Bag as I was decorating mini cupcakes. If you are decorating full size cupcakes, I recommend using a Wilton #124 Decorating Tip or larger. 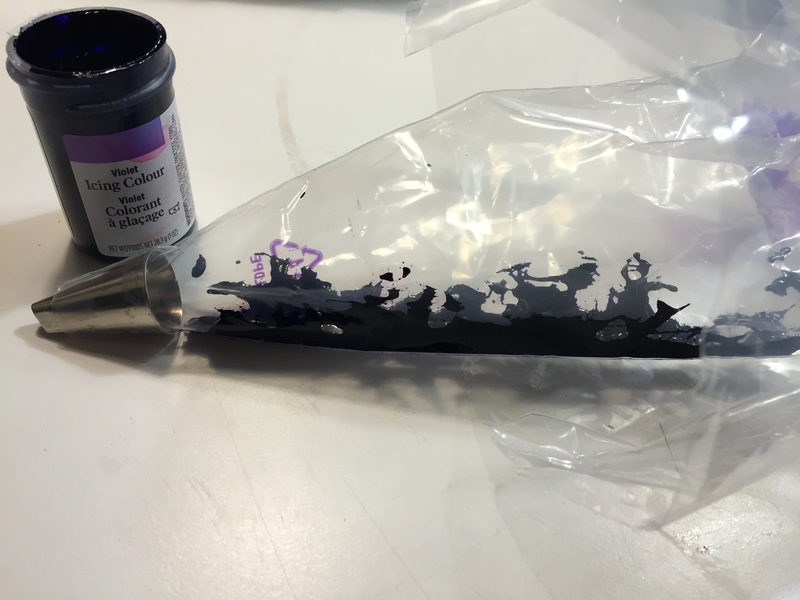 Ensure that the smaller point of the decorating tip lines up with the seam of the decorating bag! This is key to getting the 2 tone trim of the petal correct. Step 2: Using a butter knife, dip the end into the icing colour of your choice (I used Wilton Violet Gel Icing Colour). 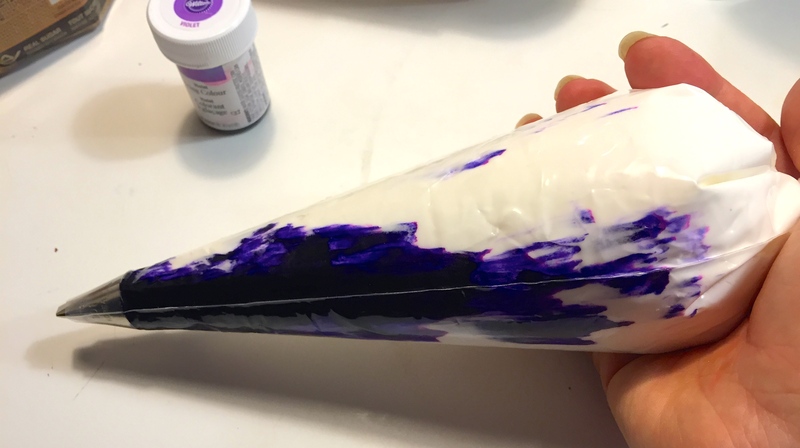 Carefully spread the gel icing colour along the inner seam of the empty decorating bag, right from the tip, all the way to the top. I used a bit too much in the photo below, a little bit really does go a long way! Step 3: Fill your decorating bag with the icing of your choice. I decided on a premade white icing, that in retrospect wasn’t as stiff as it should have been. I compensated for this by putting it in the freezer for a few minutes every so often while decorating so it would harden up a bit, but I highly recommend starting with a nice stiff buttercream icing to make your decorating quicker and easier! You can choose any colour that complements the first tone chosen. Step 4: With the coloured seam and smaller pointed end of the tip facing up, wider rounded end of the tip touching the cupcake, make a small oval or “U” shape with the icing in the middle of your cupcake. Lift the icing bag completely away from the cupcake. Step 5: Add the first “petal” of icing, making sure you overlap the open end of the “U” shape. Step 6: Continue to add overlapping petals, ensuring you turn the cupcake as you go, and lift the icing completely off in between petals or you may end up with a carnation instead of a rose! Step 7: As you get to the outer few layers of petals, you can lift the tip right off the cupcake top itself to add extra dimension and fullness to the flower. Step 8: Run a clean finger or butter knife around the edge of the cupcake to tuck in any stray wisps of icing. Decorating Steps 4 – 8. As you can see, I started off with WAY too much icing colour, and it thinned out as I went along. It was an accident, but I kind of like how each rose is totally unique! Check out my tutorial video below that covers Steps 4 – 8 of how to make 2 tone rose cupcakes in a short, 1 minute clip! Tell me, what is more helpful to you; notes and photos or video with voice over? And as always, be sure to share your comments, questions and creations with me!